Pakistan, today conducted a successful Flight Test of the indigenously developed Air Launched Cruise Missile, Hatf-VIII (Ra’ad). The Ra’ad Missile, with a range of over 350 KM, enables Pakistan to achieve strategic standoff capability on land and at Sea. ‘Cruise Technology’ is extremely complex and has been developed by only a few countries in the world. 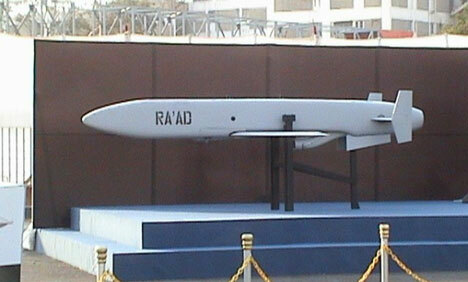 The state of the art Ra’ad Cruise Missile with Stealth Capabilities is a Low Altitude, Terrain Hugging Missile with high maneuverability, and can deliver nuclear and conventional warheads with pin point accuracy. A major additional feature of today’s test was the effective employment of the National Command Authority’s fully automated Strategic Command and Control Support System (SCCSS). It has enabled robust Command and Control capability of all strategic assets with round the clock situational awareness in a digitized network centric environment to decision makers at National Command Centre (NCC). The system has the added capability of real time remote monitoring of missile flight path. The successful launch has been commended by the President, the Prime Minister of Pakistan, and Chairman Joint Chiefs of Staff Committee who have congratulated the scientists and engineers on their outstanding achievement. This entry was posted in ISPR Press Releases, News and tagged Cruise missile, HATF VIII, Hatf-VIII (Ra’ad), Pak Army, Pakistan, Pakistan Army, Pakistan military, Ra'ad, SPD. Bookmark the permalink.